Hello everyone! Today we are doing a hop for two very special ladies. Happy birthday to Corinne and her twin sister Irene. Betty from Simply Betty Stamps was very generous and drew two images as a surprise. One of Corinne and one of Irene. I have colored them up with the next generation Spectrum Noir markers. I also used Pop 'n cuts system designed by Karen Burniston. I hope everyone is having a fantastic holiday. Here is a quick share of my Christmas card that I sent out this year. 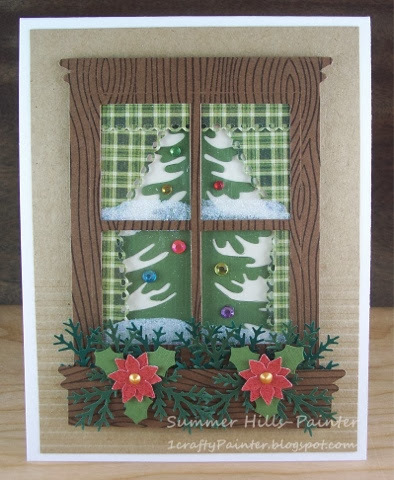 I have used the Sizzix window die, Memory Box curtains, La-La Land crafts tree die, Martha Stewart branch punch, EK Success holly punch and the McGill petite petals punch. The wood grain was done with a Lawn Fawn stamps. Hello everyone! Well a new challenge has begun at The Stamping Chef. We are now hosting weekly challenges. The current challenge is Anything Goes!